I love my Gorillapod. When people see me using it, they all look at it in amazement and it always end up with them asking me where I bought it and for how much. I bought my Gorillapod locally, at the 5th Avenue store for Php1,400. I always say that it’s a great value for a great product. Honestly, I didn’t mind shelling out 1,400 for it. Labeled as the CEB Camera Flexi Tripod in Pouch, this technically isn’t THE Gorillapod, but looks surprisingly close to one. I wonder how it would compare to the original though. Is it as sturdy? As flexible? As stable? Does it grip as well as the original Gorillapod? I made the huge mistake of being cheap and not buying it so I can compare the two. 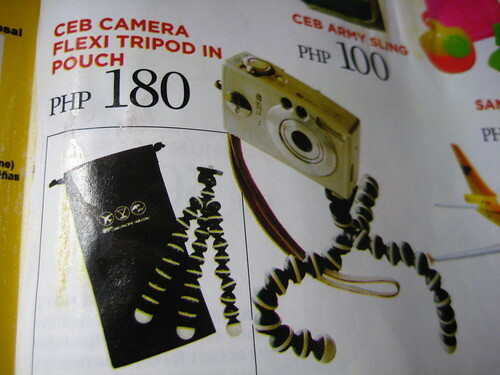 Anybody have Cebu Pacific’s version of the Gorillapod? I would love to hear your reviews about it! Hi Nina! Hmmm, you have seen another Smile Mag ha so meaning galing ka isang flight Ito na ba yung Donsol trip mo? Wee! looking forward for your pics! PhP180 is peanuts compared to the PhP1k+++ ones! Four dollars (U.S.) for a Gorillapod? I certainly hope not! A quick Google search for “flexi tripod” turns up a number of knock-offs, including the Monkey Pod, the Jacobs Mini Flexi Tripod, the PIK mini flexi tripod, and the (no, I’m not making this up) Goofy Flexi Tripod (http://www.lensamalaysia.com/forum/showthread.php?t=4729), a cheap knock-off from Malaysia that appears to be the same as the one you picture here. Just like Pinky Street figures, it’s hard to tell the difference between the “real thing” and a “cheap fake” from a photograph, but I’m sure the difference is significant. Davidd: Wow. I am speechless. That Goofy pod is a perfect clone. But hmm, where do yo think the difference lies? In the quality of the material? the flexibility? Dunno. A REAL travel blogger woulda coughed up the five bucks to find out!